Command in 1916 was a cumbersome and frustrating experience because of communications’ limitations. 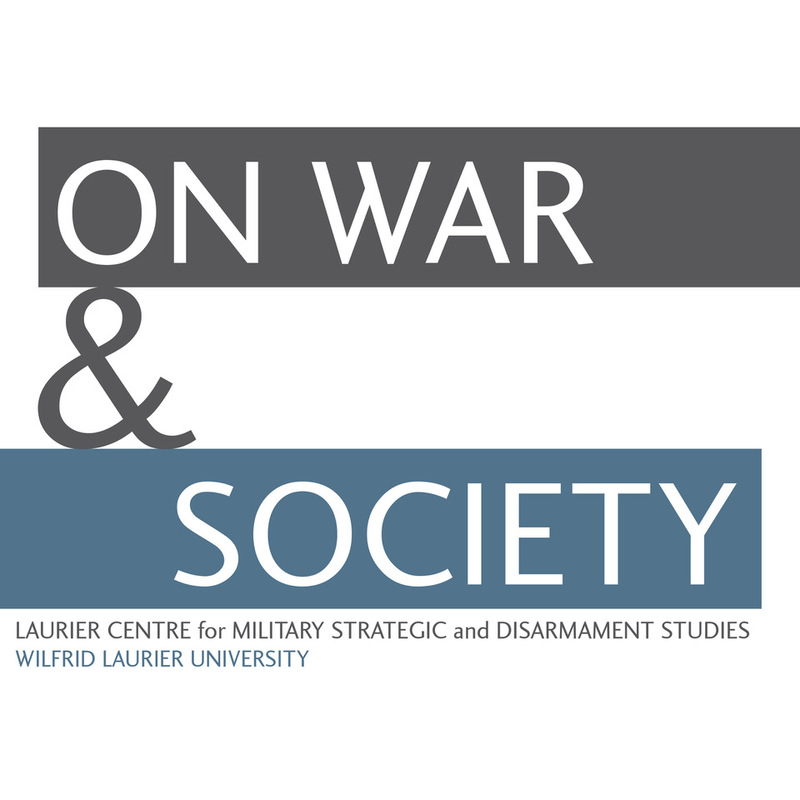 Much of the sclerotic and fractured decision-making during battles was the result of an information blackout from the front and inability to transmit orders rapidly. In many respects, Wellington at Waterloo had more control over his units than did a corps commander on the Somme. Wellington could send a despatch rider to any portion of the front in a matter of minutes with a reasonable certainly that the message would be received. This communication net, albeit at the pace of a mounted rider, reached down to the battalion level, where the battalion commander was in visual and voice contact with his unit. On the Somme, communications were essentially instantaneous down to the level of the brigade and sometimes as far as the battalion. Forward of the battalion headquarters communications were at the pace of a runner dodging sniper, machine gun, and artillery fire. Communications were unreliable, tardy, and dreadfully uncertain. It was easier to connect with another officer one hundred miles away than your own troops two kilometres distant. The result of these communication deficiencies were opportunities missed, failures reinforced, and failed attacks repeated. With messages taking hours to reach their destination, the only option was to impose a clockwork mechanism on attacks, as there was little a commander could do during the course of the battle. 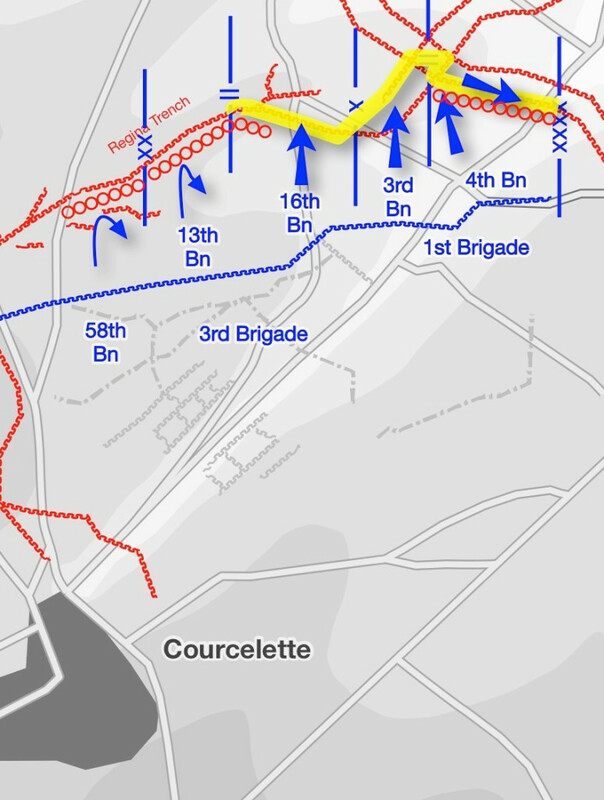 An example of this difficulty of making decisions based on evidence from the front was the 1st Division’s abortive attack on Regina Trench on 8 October 1916. Unbroken wire stopped the 13th Battalion’s attack, and the Germans cut the battalion to pieces almost immediately. Initial reports for all four of the 1st Division’s attacking battalions indicated they were successful. Later, unconfirmed reports suggested that the 13th Battalion was repulsed, but the 3rd Brigade did not confirm this until 9:05 a.m., almost four hours after the failure. Regina Trench 8 October 1916 – 1st Division Situation 2:00 p.m. There were five primary means of communications available, all with major disadvantages: by runner; wire; visual (usually flags); pigeon; and power buzzer. Wireless sets were far too heavy, bulky, and fragile to be practical forward of the division headquarters. Runners were the dominant communication method, which meant message speed at the pace of a man dodging enemy fire, if the message arrived at all. By wire, via a telephone, was the fastest method but was subject to frequent outages and breakages in the line as the German artillery shelled all the Canadian rear areas. Even when the telephone lines worked they were subject to much interference and crosstalk. D.E. Macintyre, a brigade staff officer, reported in his diary “A trench telephone is the most aggravating thing in the world. Most of the time the connection is so poor that you can’t hear half what the other fellow says” then the line would break. Flag use was wholly impractical as the signaller had to find a location out of view of the enemy in conditions of clear visibility. Smoke and dust from shelling usually rendered visual means impossible. Pigeons were of limited utility as they could not be used at night or in poor visibility, and only a limited number could be kept close to the front. The power buzzer was a means of one-way communicating through ground induction, but the high command minimized its use after discovering the Germans could overhear conversations. As a result, any form of wired or ground communication close to the front was limited to the most basic of communications or in code for fear of the Germans intercepting them. In one notorious case on the Somme, a staff officer at the insistence of his British brigade commander read an operational order over the phone to a forward battalion, and the Germans overheard it. The subsequent attack was bloodily repulsed. A later British attack captured the translated order in a German headquarters dugout, resulting in the brigade commander and staff officer both getting sacked. In rare conditions, aircraft contact patrols could render rapid and accurate information about the forward positions. At Courcelette on 15 September, an aircraft was able to report the advanced positions of the 2nd Division with only a ten-minute delay. 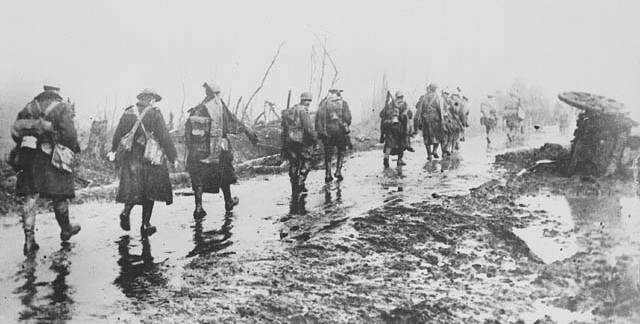 These contact patrols rarely worked, however, because of weather, difficulties in accurately locating the forward infantry line, and an understandable reluctance by the infantry to expose their position. The adventures of a Forward Observation Officer (FOO) trying to communicate with his artillery batteries provide a good example of the frustrations associated with establishing communication. The FOO in this particular example was supporting the 3rd Brigade’s attack on Regina and Kenora Trench on 26 September 1916. Initially, he did not lay wire as their party advanced because it would likely be cut by German artillery fire and expected to use flags. His party suffered casualties, so he returned to the Canadian lines to get more men. The German artillery fire had lessened, so he decided to lay wire on the way back to the front. He finally reached his observation point and reported the final objective captured and that the enemy fire was slackening. However, renewed German artillery fire, presaging a counterattack, severed the line, and dust and smoke obscured any visual communications, so he had to send runners. The German counterattack succeeded in driving out the Canadians. Effectively, he only sent three messages in three and half hours and those at the end of the period. He had no appreciable effect on the battle and could not direct artillery fire to stop the German counterattack. The schematic below illustrates the nature of the communications challenge on the Somme. 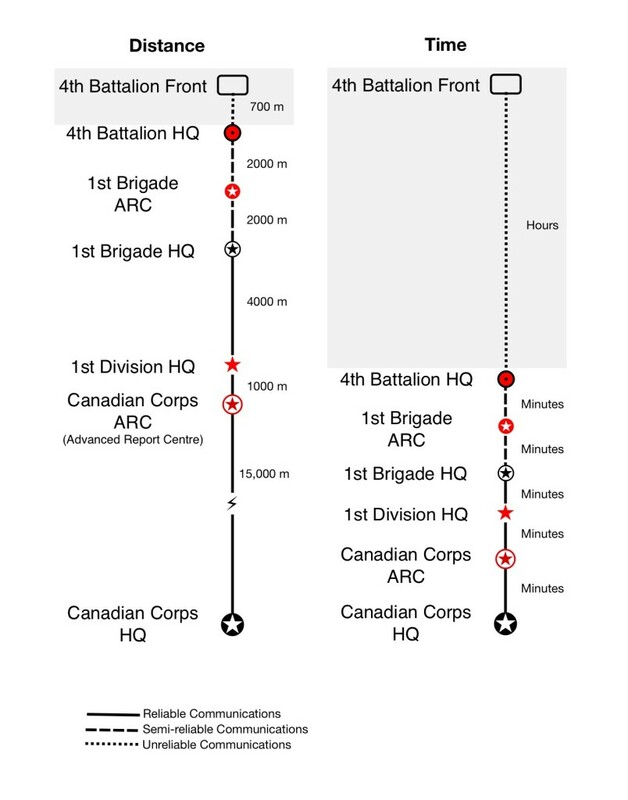 It shows the distance, time, and delivery reliability of messages up and down the chain of command for the 4th Battalion’s attack on 8 October 1916 on Regina Trench. Far to the rear of the attacking battalions were the brigade, division, and corps headquarters – the 1st Division’s headquarters was 8,000 metres from the headquarters of the 4th Battalion. Senior officers down to the level of battalion commanders remained at their headquarters to ensure ready communications with their superiors. In responses to a Canadian Corps post-battle questionnaire, the majority of battalion commanders believed staying at their headquarters gave them the best means of influencing the battle. The headquarters were so far in the rear because of the enormous effort required to bury the complex network of cables needed to ensure reliable communications. Each cable was buried at least six feet to prevent all but the heaviest German shells from severing them. In the conditions of the Somme, where keeping the roads and lines of communications open required all the available engineers and work parties, there was no surplus labour to bury cables. As a result, headquarters remained stationary even as the lines advanced. Communications up to the brigade were usually reliable and rapid because of telephone lines. Forward of the brigade, the lines were not buried deeply so were often broken by German shellfire, despite this they were still fairly reliable. However, beyond the battalion headquarters, the zone in gray, the situation was dramatically different. Wire was usually cut; power buzzers were heavy, unreliable, subject to interference, and German interception; and flags and other visual means were virtually impossible because of smoke and dust. As a result, communications were usually reduced to the pace of the runner. On 8 October, for instance, the 16th Battalion held Regina Trench for fourteen hours and successfully sent and received one message. First World War generals have received much criticism for their conduct of battles, but these critiques often overlook the limited means of command and control at their disposal. Later in the war, commanders spent less time groping in the dark trying to discern developments at the front. 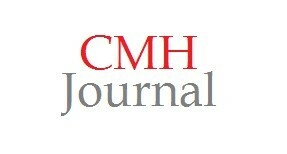 A topic worth further discussion is what changes in technology, tactics, and training allowed for greater control?